Oakland's Toxic Lead Contamination Isn't in the Water. It's in the Buildings and Dirt, and It's Bad. That is, until Reuters' review of public lead contamination data prompted several Bay Area media outlets to shine a light on the Fruitvale's lead problem. But actually, the dangerous levels of lead pollution in the Fruitvale and other areas of Alameda County isn't new information. Federal, state, county, and city environmental officials have known about the Fruitvale's lead contamination for years. In fact, the key figure cited in Reuters' report is from a 2012 California Department of Public Health Study: Blood samples of 502 children under age six who live in the Fruitvale showed dangerously elevated levels of lead. About 7.57 percent of these kids had blood lead levels exceeding 4.5 micrograms per deciliter. Translation: Fruitvale kids are being poisoned, and the lead found in their blood exceeds levels found in Flint. And unlike Flint, the source of lead in the Fruitvale isn't drinking water. The East Bay Municipal Utility District routinely tests the neighborhood's water and says it's safe to drink. According to an EBMUD press statement issued today, extensive testing shows that Oakland's water meets or surpasses all federal and state drinking water requirements, including the U.S. Environmental Protection Agency’s Lead and Copper Rule. The District also has an active corrosion control program to prevent corrosion in water pipes, including the pipes installed in apartment buildings and homes. "The water in the Fruitvale is the same that goes to the whole city," said Noel Gallo, Oakland's city councilmember who represents the Fruitvale. Gallo said his office and EBMUD have been contacted over the past couple days by residents worried their water has lead in it due to vague media reports based on the Reuters article. But in fact, Fruitvale's contamination is arguably in a more dangerous and difficult place to clean up. It's spread around in the buildings and soil, and it gets kicked up in the air from the wind and traffic. Lead is all over Oakland, and it's especially concentrated in the Fruitvale where old rental properties constantly shed the toxic metal into the environment. "For the most part, the lead cases we're running across, it's usually a case of deteriorated paint," said Larry Brooks, the director of operations for Alameda County's Healthy Homes Department, a county agency that is on the forefront of tracking lead contamination and funding cleanup efforts. According to Brooks, Oakland has an enormous number of buildings that were constructed before 1978, the year that lead was banned as an ingredient in residential paint products. As a result, many of the city's homes and apartments are coated with it. "We're finding it often as a result of deteriorated paint from the exterior, rain rinses it into the soil and contaminates it," he said. In one high-profile case from 2014, a child living in a 55-unit apartment complex on 36th Avenue in the Fruitvale was poisoned by lead. Over the past decade, Oakland building inspectors have been called to the property to check on numerous complaints including "chipping paint," "crumbling" ceilings, and mold that was "making children sick," according to city records. City inspectors verified the building's various code violations, and they reported the lead problem to Alameda County health officials. According to 2014 county records, there were at least 20 households in the apartment building with children and babies, the majority of them very-low income and largely Spanish-speaking families. Children play in the dirt around the apartment building, and some of the families grow corn, squash, beans, and other vegetables for personal consumption in garden plots adjacent to the exterior walls. The building was constructed in 1959, and much of the paint used on its exterior was lead-based. Brooks said his department has been working with the property owner to fix the problem, but he added that there are numerous other buildings in Oakland that have the same issues, and they're often not reported to health officials. 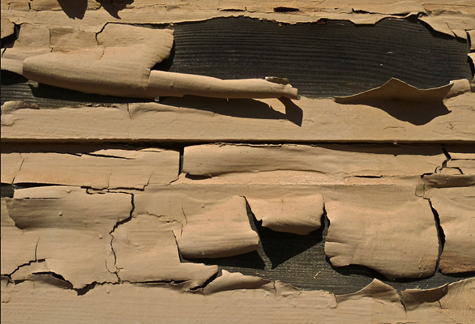 Many tenants will avoid making a complaint to their landlord about flaking paint, or signs of paint in the soil around buildings, added Brooks. "They may not realize the danger the they're putting their children in. They may be fearful a landlord will get mad at them for nitpicking," he said, adding that it's important for cities to proactively inspect properties for lead in order to take the burden off renters. Oakland launched a proactive rental inspection pilot program in October of 2015 called the Safe Housing Inspection Program, or SHIP, but it's unclear how many properties have been inspected, and whether the program is identifying lead contamination issues. Mayor Libby Schaaf and City Administrator Sabrina Landreth did not respond to a request from the Express for documents related to the city's SHIP pilot program. One other big problem regarding Oakland's lead contamination problem is the lack of funds to clean it up. Currently Alameda County distributes grants to rental property owners so they can hire certified contractors to strip away lead paint. But the source of funding is the federal Department of Housing and Urban Development. Some fear the incoming Trump administration could cut funds for critical programs like these. "Government's priority should be to protect children," said Gallo. "There's no excuse for any possible withdrawal of support to solve these issues."